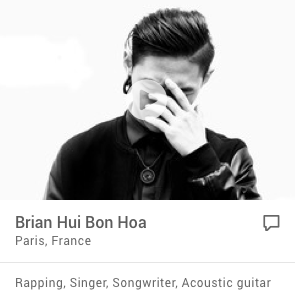 He’s a singer-songwriter from Brooklyn and he’s been on a hitch-hiking trip around the USA and Europe. In the best acoustic troubadour fashion he has collected notes and memories of his experiences on the road, and turned them into a straight journal of songs presented on this debut album. That may sound like a fairly standard premise and even well trodden territory, but Stout has something about him that sets him apart. It has been said that if Paul Simon were young and poor in 2006 this is what he would sound like. That’s certainly high praise and a fair comparison too, for the attention to detail in these acutely observed lyrics, anecdotes and character studies are worthy of a young Simon. The song "Space Station" tells of the singer’s feelings of guilt as a friend twice falls into a diabetic coma on a weeks binge drinking. "I can’t help but take some of the blame, because I’ve been here all night drinking and you’re in a coma again." This is the kind of first person narrative that gives much of the album such direct emotional impact. "First Song For Jaclyn" studies ideas of purity as Stout predicts his loving feelings for a beautiful future daughter and simultaneously tells of a drunken saint who gave him some bread in exchange for money although "he didn’t need it, he lived off diesel fuel, pure as anything." In the ballad of a 64 year old performer called Curtis Jones, who’d fled a wife and kid in Detroit, Stout meets him in Europe and has the following exchange: "He called me short and I said, ‘yeah I am" / But while we’re on put downs you look like some kind of vampire. Like a vampire man." The whole album is awash with colourful snapshots like that, giving the stories contained within these songs a real resonance. If there's another impressive string to this writers bow though, it's in the way he expands upon his acoustic guitar and voice backbone. To call it psychedelic is not to mislead, for almost every one of these songs exists on a bedrock of acoustic engine room under-scored by all manner of found-sound, effects and weird organic keyboard washes and patterns. Beck hinted at this kind of thing on Mutations, but he didn’t take it this far! He’s got flexibility too, as demonstrated on "The Coronation" as it starts up like a regular rock riffage number before splintering all over the place. Closer "Story Of My Life" hints at more unpredictable musical twists to come as it cranks up an electronic rhythm of quite mechanical intensity. Aaron Stout is a voice that stands apart from the introspective troubadour pack because both his words and his music are sparkling with fresh ideas and insight. Here's a real talent. Having bagged hometown slots with M.Ward and Fruit Bats amongst similar peers, young American Aaron Stout is certainly heading towards the right audience. With an equally apt, lengthy tour support with one of the adored, plus the discovery of Queens Live In Caskets – his captivating debut - his profile should deservedly rise a few notches further. There is no escaping the fact that the torrent of singer-songwriters we have been presented with in the last half dozen years is overwhelming, and it seems now set that thousands more will follow. An increased appreciation of acoustic and rootsier sounds has propelled with awful likes of James Blunt and, God forbid, Jack Johnson to the top of the heap, but at the very least such a situation provides a platform for artists such as Aaron Stout. He sounds nothing at all like these clowns, but there are far more acceptable touchstones that should arouse enough curiosity to track down this peach. Vocally, think of Cass McCombs, Jim James and Stuart Staples with occasional inflections of Neil Young and the whooping-at-the-end-of-a word histrionics of David Eugene Edwards (as displayed particularly on the fabulous First Song For Jaclyn). But Stout is no dreary indie whinger: he labels his music folk-rock, and that’s a fair enough tag. Apart from the slow metallic pop of opener The Coronation, this is pretty much an introspective, acoustic, and earthily folky affair – but there are unexpected twists that elevate Queens far above standard singer-songwriter fare. There is all manner of oddness present, existing independently behind songs to hint at a restless compositional mind attempting to create atmospherics beyond words and music. The sounds of malfunctioning machines, messy feedback, random pops and clanks drop in and out, not distracting from the song, but adding condiments and herbs to an already tasty soup. The best instance of this is what appears to be the yap of a terrier, totally off-the-beat amidst the downbeat beauty of the blissful Fountain of Youth. The uncanny thing is, that if you were to not expect the yap of a terrier at any point in this song, it’s dropped in the perfect place to have the desired effect – if you get my drift. The most obvious comparison is (again) M.Ward’s End of Amnesia, and it is a joy to report that some of the numbers here are as good as anything on that album, albeit interpreted with a smaller budget. This is very much a lo-fi presentation, also reminiscent of Drowsy or Mugison at times, but it never detracts from the high quality melodies on show. The dubby Talk Out of Turn in particular is a grand and elegant example, signaling that in this leftfield roots performer we have a name to watch. 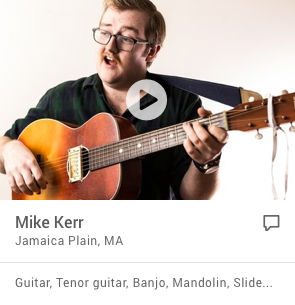 NPR.org, January 15, 2008 - Aaron Stout is a singer-songwriter from Brooklyn, NY who makes ethereal, lo-fi psychedelic folk. His first full-length release is Queens Live In Caskets, a largely homemade album out on Monotreme Records. Stout says the name of the album is arbitrary, but hopefully conveys the spontaneous, stream of conscience nature of his work. Over the span of three years, Stout traveled across the U.S while recording "in various rooms and people's basements." 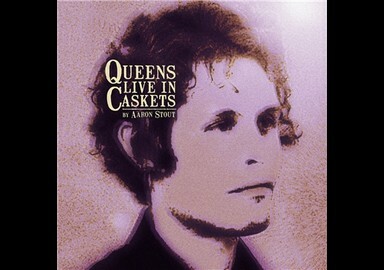 Queens Live In Caskets is a compilation of songs about Stout's former state of mind, which he describes as a "sad place." Because of its transient character, the record incorporates found sounds gathered along the way. Stout describes "Fountain of Youth" as "a broken love song." It's an odd mix of Stout's soulful, gentle voice, delicate guitar, and Theremin, with found sounds. The songwriting follows the predominant theme of the record: "a sense of longing, longing for redemption, physically and spiritually." "Fountain of Youth" has a more distinct organic instrumentation compared to other songs that experiment more with synths and electronic textures. It points to Stout's range of childhood music heroes: Michael Jackson, David Bowie and Hank Williams. there is all manner of oddness present, existing independently behind songs to hint at a restless compositional mind attempting to create atmospherics beyond words and music. This emerging 27 year old reveals vivid images of travel, heartbreak and spirituality in whatever hes working on. All of this, encrypted with brooding layers and ethereal sounds, further the listeners experience. In September 2005, his song Ballad of Mr. Lamatta was featured on a monthly compilation put out by Comes with a Smile Magazine (UK) alongside artists including Sleater-Kenny, Frank Black, American Analog Set and Four Tet. Currently, Aaron is completing his second album that is rumored to be filled of the type of vibrancy and elegance that could only come from heaven on high.